If you’re serious about attending the USNA or any other military academy, buy a few books (or check them out of the library) on the process. It’s worth the investment because if you pursue this dream, you will be investing much more of your time and money to achieve your goal. Better to make sure this is the direction you want to go. From the perspective of a woman who was accepted and how she accomplished it. Down-to earth, personal, definitely not dry, and should give confidence to any teen, male or female, considering a military academy their first choice college. March 25th is National Medal of Honor Day – when we pay respects to service members who distinguished themselves through “conspicuous gallantry and intrepidity at the risk of life above and beyond the call of duty”. Citations for Medal of Honor recipients describe feats of courage, strength, and resilience. Recipients overcame the paralysis of fear, and in some cases, they persevered in spite of wounds that would normally be so painful as to be disabling. Some of these heroes willingly gave their lives for the sake of their buddies. From my friends over at ArmyLive , here are eight surprising facts about the award. Bernard J.D. Irwin was an Assistant Surgeon in the Army when he voluntarily went to the rescue of 2d Lt. George N. Bascom who was trapped with 60 members of the 7th Infantry. Irwin and 14 men began the 100-mile trek to Bascom’s forces riding mules. After fighting and capturing Apaches along the way, as well as recovering stolen horses and cattle, Irwin reached Bascom’s forces and helped break the siege. The Medal of Honor was awarded to Irwin on Jan. 24, 1894 – more than 30 years after he performed his heroic deed. 2. Originally, the Medal of Honor was only awarded to enlisted service members. On March 3, 1863, this was extended to include officers as well. 3. There are three versions of the Medal of Honor: U.S. Army, U.S. Navy and U.S. Air Force. Members of the U.S. Marines Corps and U.S. Coast Guard are eligible to receive the Navy version. Each of the armed services maintains their own regulations governing the award. 4. Only one woman has received the Medal of Honor and her award was temporarily rescinded. President Andrew Johnson presented the Medal of Honor to Dr. Mary E. Walker on Nov. 11, 1865 for her work as a Contract Acting Assistant Surgeon in a series of battles from First Bull Run in 1861 to the Battle of Atlanta in 1864. Caught by Confederate troops and arrested as a spy, she also spent four months as a Prisoner of War. 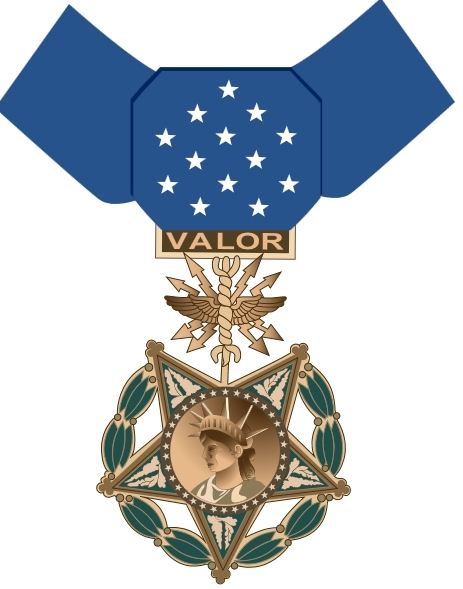 Although her award was rescinded along with hundreds of others in 1917, upon the passage of legislation that stated the medal could only be given to persons who had engaged in “actual combat with an enemy,” Walker’s Medal of Honor was restored on June 10, 1977 by President Jimmy Carter. Because of her selfless service during the war, Dr. Mary E. Walker became the only woman in U.S. history to receive the Medal of Honor, which was rescinded in 1917 and restored in 1977. 6. Children of Medal of Honor recipients are not subject to quotas if they are qualified and desire to attend the U.S. military academies. Colin Romesha, son of former Staff Sgt. Clinton Romesha, is escorted off the President’s podium during the Medal of Honor ceremony in honor of his father at the White House in Washington, D.C., Feb. 11, 2013. Romesha received the Medal of Honor for his courageous actions during a daylong firefight in Afghanistan in October 2009. They are allowed to wear their uniforms at any time or place they choose, unlike other military personnel or retirees. For the eighth, please visit ArmyLive! for their great article on this topic and more. From the perspective of a woman who was accepted and how she accomplished it. Down-to-earth, personal, definitely not dry, and should give confidence to any teen, male or female, considering a military academy their first choice college. Jacqui Murray is the author of the popular Building a Midshipman , the story of her daughter’s journey from high school to United States Naval Academy. She is the author/editor of two military-tech thrillers, To Hunt a Sub and Twenty-four Days (starring the USS Bunker Hill), and over one hundred resources on integrating tech into education, webmaster for four blogs, an Amazon Vine Voice, adjunct professor in technology-in-education, a columnist for TeachHUB, and a freelance journalist on tech ed topics. You can find her tech books at her publisher’s website, Structured Learning. From the perspective of a woman who was accepted and how she accomplished it. Down-to earth, personal, definitely not dry, and should give confidence to any teen, male or female, considering a military academy as their college of choice. December 8th, 2018 is the 119th annual Army-Navy Game, at noon in Lincoln Financial Field, Philadelphia PA, noon PDT. This is an American college football rivalry game between the teams of the Black Knights of the United States Military Academy (USMA) at West Point and the Midshipmen at the United States Naval Academy (USNA) at Annapolis and has come to embody the spirit of the United States Armed Forces. Navy leads the all-time series 60-51-7. Army won last season’s meeting 14-13. National Pearl Harbor Remembrance Day, which is annually on December 7, commemorates the attack on Pearl Harbor, in Hawaii, during World War II. Many American servicemen and women lost their lives or were injured on December 7, 1941. National Pearl Harbor Remembrance Day is also referred to as Pearl Harbor Remembrance Day or Pearl Harbor Day. Jacqui Murray is the author of the popular Building a Midshipman , the story of her daughter’s journey from high school to United States Naval Academy, and the thrillers, To Hunt a Sub and Twenty-four Days (starring the USS Bunker Hill). She is also the author/editor of over a hundred books on integrating tech into education, adjunct professor of technology in education, webmaster for four blogs, an Amazon Vine Voice book reviewer, and a freelance journalist on tech ed topics. She is the parent of a Naval Officer and an Army Sergeant. Jacqui Murray is the author of the popular Building a Midshipman , the story of her daughter’s journey from high school to United States Naval Academy. She is the author/editor of two military-tech thrillers, To Hunt a Sub and Twenty-four Days (starring the USS Bunker Hill), over one hundred resources on integrating tech into education, webmaster for four blogs, an Amazon Vine Voice, adjunct professor at UC and CSU, a columnist for TeachHUB, and mother of a LT CDR in the Navy and a SGT in the Army. October 10th: Happy Birthday, USNA! October 13th: Happy Birthday to the World’s Greatest Navy!